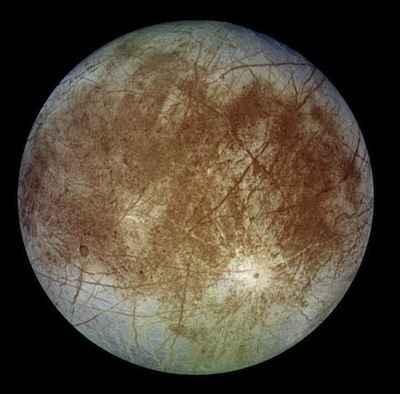 Europa's ocean may have enough oxygen to support life, according to new research by Richard Greenberg of the University of Arizona. Jupiter's frozen moon is believed by scientists to have a liquid water ocean several miles underneath its frozen surface; the water is kept in a liquid state by heat generated from tidal forces. Scientists have questioned whether there is enough oxygen dissolved in the water to support living organisms. Greenberg has considered three generic resurfacing processes: gradually laying fresh material on the surface; opening cracks which fill with fresh ice from below; and disrupting patches of surface in place and replacing them with fresh material. Using estimates for the production of oxidizers at the surface, he finds that the delivery rate into the ocean is so fast that the oxygen concentration could exceed that of the Earth’s oceans in only a few million years. Greenberg presented his findings at the 41st meeting of the American Astronomical Society’s Division for Planetary Sciences last week. Science fiction fans observe this new research with delight, having seen this idea popularized a quarter-century ago by Arthur C. Clarke in his 1982 novel 2010: Odyssey Two, as well as in the excellent 1984 film made from the novel. Clarke himself credits the idea of life in Europan oceans to a 1980 Star and Sky article by Richard C. Hoagland titled The Europa Enigma. At the time, Hoagland's idea was panned by most planetary scientists and NASA as well. But Clarke enthusiastically supported it immediately. Take a few minutes to admire the excellent pre-digital age special effects from the movie in this video clip which shows the discovery of life on Europa. From Universe Today; thanks to Moira for providing the tip and sf references.